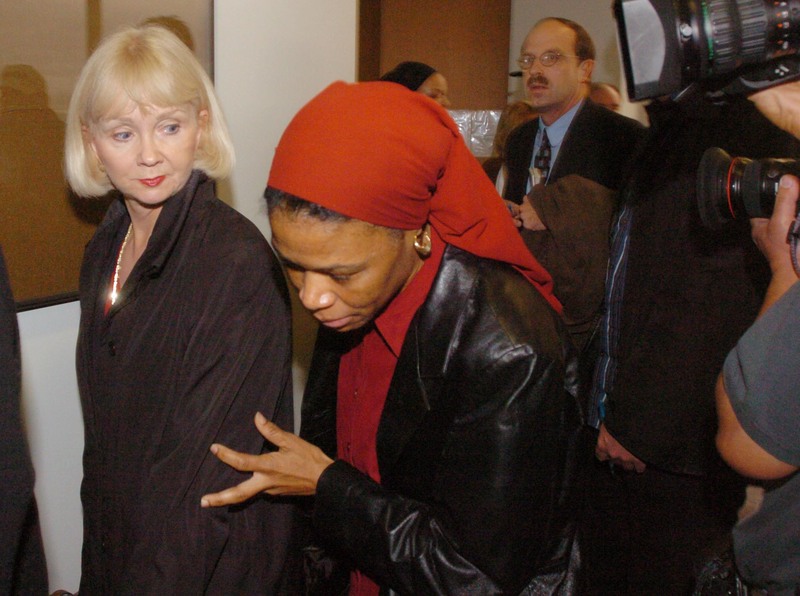 Yusuf Bey IV's mother, Daulet Bey, with red scarf, and attorney Lorna Brown leave courtroom Dec. 1, 2005, following a hearing in one of several cases against Bey IV. (BobLarson/ContraCostaTimes). SAN FRANCISCO — With the state Bar out to strip her of her law license, East Bay attorney Lorna Brown admitted in court Tuesday that she and her former client Yusuf Bey IV jotted down the names of witnesses in the murder case of an Oakland journalist during a jailhouse visit and smuggled it past guards. But, she insisted, it wasn’t a hit list, as prosecutors have alleged. It was simply an effort to help her track down witnesses she needed to interview to defend Bey, the infamous Your Black Muslim Bakery leader later convicted in the killing of Oakland Post editor Chauncey Bailey. Brown’s explanation on how she became tangled in scandal connected to the high-profile 2007 murder case came on the first day of a rare state Bar Court trial that could end her law career. Her actions were “stupid,” Brown said during a series of tense exchanges with State Bar prosecutor Robin Brune, who wants Brown disbarred. Brown, 67, often speaking sharply and jutting her chin at Brune, added that she regretted lying about smuggling the papers when law enforcement officials first questioned her in March 2010 and that she almost fell into “a catatonic state” over what she had done. When Brune asked her why she took four months to eventually tell investigators the truth, Brown responded, “I don’t know.” Her attorney, Vicki Young, repeatedly told Judge Patrice McElroy that Brown was concerned about violating Bey IV’s attorney-client privileges. The list Brown admitted writing was never recovered, Brune said. But another document that investigators found in a car that Popoff was driving showed how close someone may have come to being hurt, Brune said. That was a transcript of a statement given by Bailey’s confessed killer, Devaughndre Broussard, who had turned state’s evidence and said Bey IV ordered the journalist and two other men killed in the summer of 2007. Bey IV had highlighted Broussard’s San Francisco address in legal documents and written “Gary, that’s where he’s from” in the margin, Brune said. Brown testified that she never looked at the documents Bey IV gave her. Brown admitted she met a member of the Bey family on an Oakland street corner two days later and handed off the papers. Brown said that she “got a really bad feeling after the transaction,” but didn’t do anything about it. That same day, the Alameda District Attorney’s office received a tip about the people on the list. “We were told they were to be killed,” Michael Foster, an inspector in the office, testified Tuesday afternoon. Popoff was quickly arrested, and transcripts of Broussard’s statement and those of two other witnesses were found in his car, Foster said. One of the witnesses was relocated “back east” for a month or more, Foster said. A retired inspector from the same office said that she found that Brown had also smuggled documents past guards in violation of jail rules three previous times. Those papers included sealed envelopes addressed to Popoff and religious writings, the retired inspector, Kathleen Boyovich, testified. Since Brown has admitted what she did, the two-day trial centers on how she should be punished. The state Supreme Court has already rejected a two-year suspension of Brown’s law license negotiated in a 2011 plea deal and signaled justices want a tougher sanction. McElroy will issue a written decision on the case later this year and recommend Brown’s discipline to the Supreme Court. Bar statistics show that fewer than 1 percent of the state’s roughly 178,000 active lawyers were disbarred in 2011, the last year for which records are available. Brune repeatedly asked questions Tuesday about what harm the foiled plot did to the murder case against Bey IV. Christopher Lamerio, the prosecutor who won a 2009 grand jury indictment against Bey IV for Bailey’s murder and two others, said the harm was acute and created fear in witnesses at a pitched level. “I am hard pressed to think of a case where fear ran more rampant than in this one,” he said.